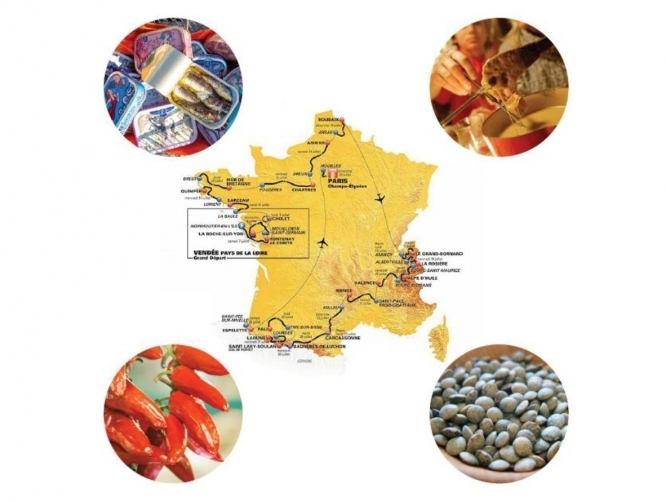 As this year’s Tour de France wends its way around the country we take a look at the gastronomic delights of the regions it passes through. This year it is very nearly 100% French with only a tiny 15km detour into Spain. Le Grand Départ is on July 7 on the Ile de Noirmoutier in the Vendée, where the most expensive potatoes in the world are grown. These are the small, round Bonnotte potatoes which chefs seek out for their subtle chestnut flavour. The production of this old variety was relaunched in 1995, and a year later it was put up for auction, as a marketing gimmick, at the Hôtel Drouot, which specialises in art collections. 5 kilos sold for 15,000 francs or €2,286 euros – €457 euros a kilo. The cyclist could savour these pricey potatoes together with the emblematic white bean, the Mogette which is traditionally served with butter and can be eaten with the Jambon de Vendée. Unlike many other hams it is pressed, which makes it rectangular in shape and as a result the drying stage is short. It is cured with salt, and flavoured with a wine based eau de vie, cinnamon, pepper, thyme and bay leaves.